A dog narrowly avoided death after eating more than 20 chocolate cupcakes. 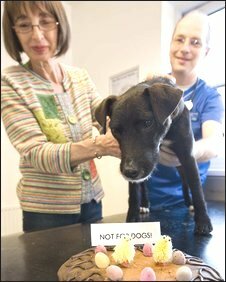 Polly, a one-year-old Patterdale terrier from Southampton, ate the cakes after being accidentally locked in the family's kitchen by her owners. Owner Yvonne Taylor found the canine surrounded by chocolate wrappers and, knowing of the dangers of cocoa poisoning, contacted vets. The greedy canine has since made a full recovery after treatment at an animal hospital in Southampton. Ms Taylor said: "I remember reading that cocoa could be poisonous to pets, and having used quite a lot in the cakes, I was concerned for her. "The PDSA (People's Dispensary for Sick Animals) vets were brilliant and went that extra mile to save Polly. "They gave her an injection to induce vomiting and then proceeded to wash out her stomach under a general anaesthetic." A PDSA spokesman, said: "Easter wouldn't be Easter without chocolate, but it is a time when pets are at increased risk from potentially fatal chocolate poisoning. "Luckily, Polly pulled through and survived. The amount of chocolate she ate could have killed her had her owner not recognised the danger and contacted PDSA so swiftly."